Demonstrating how on edge the market is over any favorable (and vice versa) developments in the ongoing US-China trade war, a couple of conflicting headlines out of China shortly before 3am ET sparked turmoil across asset classes. Just a few hours after Trump's interview with the WSJ, in which the president signaled that he would slap tariffs on remaining Chinese imports and he’ll likely push forward with plans to increase tariffs on $200 billion of Chinese goods, and which halted a strong Monday rally, S&P futures surged gaining as much as 0.5%, then falling back into negative territory, on comments from China foreign ministry spokesman Geng Shuang. 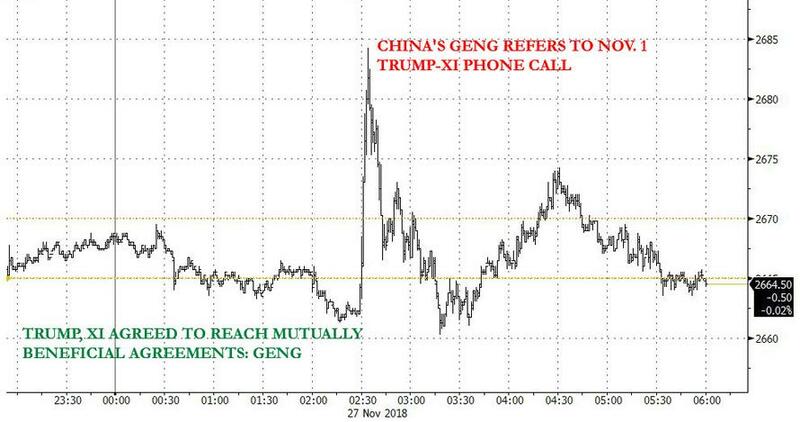 First, Bloomberg reported that during a briefing, Geng said that President Trump and Chinese leader Xi Jinping agreed to reach mutually beneficial agreements, sparking a rally in futures and a plunge in the dollar. However, this quickly reversed and futures erased gains when moments later Geng said he was referring to the phone call on Nov. 1 which Trump had already tweeted about and which has now been long priced in if not forgotten. The result was the following violent move in the overnight S&P futures, which initially surged nearly 25 points in a matter of seconds, only to reverse the entire move as it emerged that the first headline was taken out of context. The Bloomberg Dollar Spot Index also went on a roundabout trip between gains and losses as algos went from one extreme to another on the trade headlines. While nothing had actually changed or been resolved, and there was no actual news following the Chinese presser, the dramatic moves show just how sensitive algos are to any changes in rhetoric and posture, and an indication of how much "coiled" upside there is in risk assets should Trump and Xi makes some soothing comments at the upcoming G-20 summit.